From the icy pinnacle of Mount Everest to the arid heart of the Sahara Desert. Lashed to a mountain bike traversing the epic Pan Americana route and across the Atlantic Ocean on the hatch of a rowing boat. Deep into the depths of the Venezuelan rain forest via paramotor and along the entire length of Europe and Africa... on the outside of a rugged 4x4. One of the key benefits of HP tape is that it allows you to archive and protect data in a secure offsite location. But whether your data originates on an oil rig, a film set or in a state-of-the-art data center, it needs to arrive safely. This is why HP tests its LTO data cartridges in multiple, unique ways that are not required for the LTO industry standard logo. Our latest ‘extreme test’ involved a film crew, a professional ice hockey team and a HP LTO-6 Ultrium data cartridge. 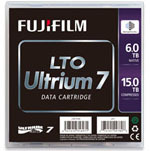 In film and broadcasting, HP StoreEver LTO Ultrium tape technology has become a standard for preserving precious and often unique digital content. Today’s camera technology allows film crews to follow the action to almost any location. But storage demands are exploding, driven by the growth of very high resolution output. With multiple cameras, it’s not uncommon for storage requirements to exceed 200 gigabytes per minute. And even a relatively small project can involve days of filming. HP LTO tape is the answer to the challenges presented by this kind of workflow. No matter where your content is created, with Linear Tape File System (LTFS), it’s easy to copy the information to an LTO data cartridge - as simple as drag and drop, in fact! And because LTO tape storage costs less than one cent per gigabyte, you can scale without limits. For example, HP StoreEver Archive Manager creates an intelligent archive by combining the accessibility of flash with the reliability and low cost of tape. It does this by presenting HP StoreEver tape libraries as a standard network share or mount point using Windows or Linux file‑sharing protocols through a flash buffer front end. Thanks to the underlying benefits of LTFS, users can use StoreEver Archive Manager to easily save, search, and retrieve data directly from the tape archive. To the user, it looks like a regular Windows or Linux folder, but all of the data is originally sourced from a data cartridge with no IT intervention or special handling. Extreme testing 2016 - tape still cuts ice! But of course, if your archive data is stored on tape, you need to be certain you can recover it. And that’s why HP LTO Ultrium cartridges are tested to extremes. In this instance, the HP LTO-6 Ultrium cartridge survived more than an hour of slap shots before the players needed a break! And when the cartridge was put back into the tape drive, all the files could be reliably recovered. Of course, you probably won’t need your HP LTO tapes for an ice hockey match! But neither will you have to worry about it surviving inside a data centre or being sent offsite for post-production and editing even while the crew are still onsite wrapping up the shoot. Storage needs may be changing faster than ever. 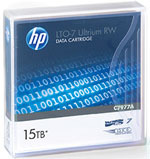 But HP tape devices and HP LTO Ultrium data cartridges are more than capable of keeping up – both on, and off, the ice! Contact your BackupWorks.com account rep today at 866 801 2944 and ask about LTO-7. We have a huge selection of LTO-7 Tape Drives, LTO-7 Tape Libraries, Autoloaders and LTO-7 Tape Media.